It seems like everyday some company releases new tablets to the market. Many options are good, but sometimes it can be confusing too for consumers. 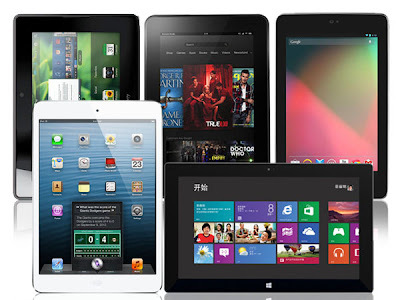 Which tablet is the best? Should I get Android or iOS or Windows 8 based tablet? My answer is: it depends on what you are going to use the tablet for. I don't think there is "the best" tablet. There is only the best tablet to answer your specific requirements for specific time frame. If you like to customize your tablet, go with Android. If you have already used and invested some apps with Apple ecosystem you may want to go with iPad. If you want new UI you can try Surface or Windows 8 based tablets. And just to remind everyone, Windows 8 based tablets are the only ones right now that can run native Microsoft Office suite which is (unfortunately) a must in today's business. There is only one iPad from Apple but there are so many Android tablets out there. Which one to choose? It depends on which brand that you trust. Or what features you are looking for specifically. Samsung Galaxy Note 10.1 offers the true stylus experience. Sony has just released the thinnest tablet in the world. Samsung products use plastic material. Some comes with a bit better Megapixel. Some comes with a bit better something that sometimes it's not really worth it. So I still believe the reason to pick between many Android based tablets material out there is for specific functionality like: whether you like stylus or not. If there is no specific function needed, you may want to look at Google Nexus just due to the fact it comes from Google. You can be sure they have done some optimization to the Android software better than anyone, for their own hardware. Similar case with Windows 8 based tablets, there are so many brands beside the Surface from Microsoft. Which one to choose? I'd personally prefer Surface due to the same reason like Google Nexus for Android: Microsoft made the OS, and they must have done some optimization for their own hardware. How about the 7 inch tablets? I believe they are good as on-the-go tablets, to be used anytime, anywhere due to their size. Apple has iPad mini, while Android has many options. But again, if you don't like to use stylus (Samsung Galaxy Note 8 inch is coming soon) I'd prefer Google Nexus 7 since it's from Google. Can we use tablet completely instead of PC? I think yes, if you don't need specific software that currently only available on PC. But even with Surface that has Office suite, I still need my Macbook Air to run specific software like Visio and Webex client. Should we buy now or wait until the next best tablet gets released? There will be always something new. So just buy a tablet when you need it, to answer your specific requirements. Most likely the tablet you buy will last only for specific time frame anyway. What are the tablets I currently use for myself and family? So the tablet is very tough even it has been tortured to the limit. The battery is still very good, it can stay more than 8 hours. And my kids don't even need the latest software so iPad 1 with old iOS is fine. But it requires some work to really make it really "the tablet for kids". I need to install appropriate apps for my kids. I need to think how to limit the Internet access for them. I need to find more education apps. I'm currently thinking to replace it with a new tablet built really for kids, like this Nabi2 from Fuhu. It has good hardware design, interesting UI for kids, and many pre-loaded education apps. I may go for it. My 14-year old kid is a future artist. She likes to paint and you can check some samples of her works here. I bought her the Galaxy Note 10.1 to let her practice drawing or sketching on this tablet. Yes indeed, it has the MS Office suite. It has expansion slot, USB and mini HDMI port. I can make and edit the document, build slides, and I did customer presentation lately with it. Windows 8, even the RT version, offers a fresh and interesting UI compare to iOS or Android. But it just lacks of many important apps. For example, there is no Webex client for Win 8 until now. For someone like me who uses Webex in daily basis, it's just unacceptable. It means I still need another device like my macbook. And since my macbook air is quite light, and it has all the software I need, why would I need the tablet then? So I may give this Surface to my assistant who will use it only for email, social media and MS Office. I like Google Nexus 7. I bought one. The price is right. I used to bring it everywhere. It's lightweight. It's really good to play games and watch movies while on the road. My only issue is to browse the Internet with it. I was not comfortable to read from the browser. So after several months I sold it to my friend who needs it for his kid, and now I'm thinking to get the iPad Mini that has a bit larger screen. I don't know if Mini is the right tablet for my purpose. I tried it couple of times and I like the way it feels in my hand. But only time will tell, only after I use it heavily I can say yes or no. And even if the Mini is worst than Nexus 7, it's considered a hot product so I can always sell it again easily. Since there is no real tablet for my business needs, it seems like I'm going to stick around with my macbook air. Plus either iPad Mini or Google Nexus 7 for content consumption whenever I need to entertain myself. Perhaps you should check your requirement before buying any tablet too. You should ask yourself what the purpose of the new tablet is, before making any decision. Because new tablets get released to the market everyday, and it's really easy to buy one because you think you need it, only to find later that you have no real use of it.